New Yorkers have always been real-estate obsessed, and as housing price records are broken on what seems like a weekly basis, the conventional wisdom is that everyone should get in while they still cannit’s not a bubble, it’s New York City. There is logic to the sentiment, of course: While the space is finite, the demand doesn’t appear to be. >Under the Bloomberg Administration, the Department of Buildings has basically moved fromm the 19th to the 21st century, so it is much easier to pull permits. There is a new website [www.nyc.gov/html/dob] where all that information is accessible. It used to seem like an insider’s game, in which you had to know somebody, or pay expediters, but that has changed..
All of these forcessboth large and small, based on economics or just gut instinct and crossed fingerssare adding up to what looks like a new environment for development in New York. 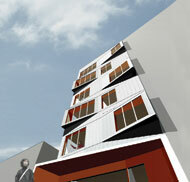 Here’s a look at some of the new buildings that are reshaping neighborhoods all over the city. Along with office space, this project includes a reconstructed Georgian-style theater and was approved for Liberty Bond financing. One of the nation’s largest green office buildings, the project includes a graywater recycling system, high ceilings for maximum daylighting, and an advanced HVAC system. 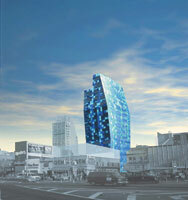 It will be the first large-scale office tower to seek LEED Platinum certification. 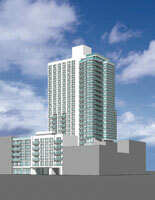 This green mixed-use tower will loom over its low-lying Hell’s Kitchen neighbors. In addition to hundreds of condominiums, the tower will also include the headquarters for the American Cancer Society and a treatment center and hospice. The building’s slim profile will allow natural daylighting into its core, and it includes bike storage areas and low VOC building materials. Frank Gehry makes his contribution to the ranks of glass-facade buildings that are beginning to line the West Side Highway. The block-filling headquarters (financed in part by Liberty Bonds) for Barry Diller’s InterActiveCorp media company will be clad in a skin of fritted white glass. 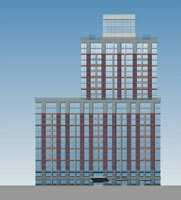 This mixed-use development in Clinton (nne Hell’s Kitchen) includes spaces for two theater companies, retail, and loft-style and conventional apartments. The architects and developers will seek LEED certification for the project, which includes bike storage, Zipcar parking, low-energy glazing, and locally produced and low VOC materials. This new loft building in the Ladies’ Mile Historic District is a harbinger of the area’s many planned residential conversions. The structure gives a nod to its contexttincluding its next-door neighbor on 5th Avenue, which housed the offices of McKim, Mead & White from 1895 to 19155with its masonry facade, cornice lines, and window proportions. A home that’s a refuge, not a second careerr is how Ian Schrager describes this condo building attached to his posh Gramercy Hotel, also under renovation on the site of the old Gramercy Park Hotel. With units going for $5 to $16 million (up to $3,000 per square foot), and only four left at press time, buyers are eating up the building’s featured lifestyle managerss ((ber-concierges) and clean, modern design by John Pawson. 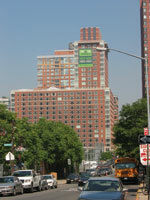 In response to this development’s location on Carl Schurz Park on the East River, its relatively large site, and developer Oren Wilf’s desire to move in to the building with his family, Peter Marino designed the project around the idea of suburban livingg in the city. In translation, that means homes are fairly large and have features like fireplaces and views of grassy yards. 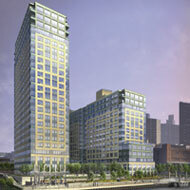 Part of Roosevelt Island’s larger revitalization, Riverwalk Place is the third building in Southtown, a smaller community on the island that will introduce 2,000 new housing units, some of which will be reserved for students at Cornell University’s Weill Medical College. 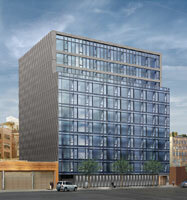 An earlier owner had asked Zaha Hadid to design a tower on this Far West Village site, but developer Barry Leistner wanted Daniel Goldner Architects for the job. 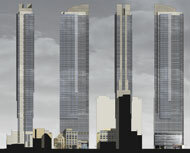 Goldner’s design for the modestly scaled building has a penthouse triplex and two duplex residences, and uses brick and glass to respond both to the neighborhood and the adjacent Richard Meier towers. After being put on the back burner for more than a decade, Philip Johnson’s design for condos will be built, albeit with a different developer. The original plan was for a radical and multifaceted building,, said project architect Matthew Barrett; it was turned down by local community groups. More recently, Selldorf Architects was asked to redesign the plans for the interiors. At the base of this glass, concrete, and zinc building are three duplex apartments, each with a 60-foot-long private backyard. The backyards arose from zoning restrictions on the project’s extra-deep lot: The developer toyed with the idea of creating a courtyard or public park before settling on private gardens to raise the value of the lower units. This super-luxurious condo development incorporates all the comforts of Andrr Balazs’ hotelsspersonal shoppers, housekeeping, and continental breakfast deliveryyas well as a bathhouse with a 50-foot lap pool, Jacuzzi, sauna, and private lounge. 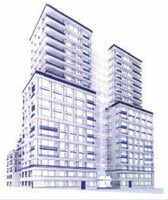 Nouvel’s first residential project in the United States, the building features red and blue glass curtain walls, massive sliding glass walls, and floor-to-ceiling windows. According to Mimi Hoang, cofounder of nArchitects, her firm got this job when a group of thee independent developers strolled into 147 Essex, a group studio housing several young firms. 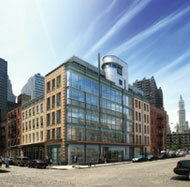 The developers saw the firm’s portfolio and were impressed enough to hire them for their first major building. 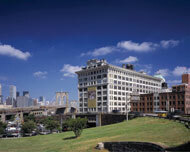 Tsao & McKown scored River Lofts, the firm’s first project with Boymelgreen Developers, through Louise Sunshine of the Corcoran Sunshine Marketing Group. The project, part ground-up construction and part restoration of a loft warehouse on the edge of the Tribeca Historic District, is designed to respect that marriage, as well as the surrounding neighborhood,, according to principal Calvin Tsao. 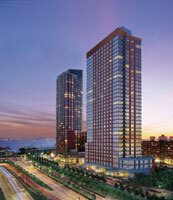 The Verdesian employs many of the same green technologies used in Cesar Pelli & Associates’ last sustainable residential tower in Battery Park City for the same developer, the Solaire, such as building-integrated photovoltaics, a fresh air intake system, and low VOC building materials. 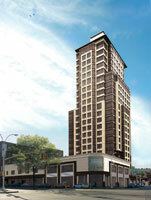 The developer is seeking a LEED gold certification for the Verdesian. This project was financed in part by Liberty Bonds. Another sports team, another railyard: Forest City Ratner Company’s (FCRC) proposal to build a deck over the Atlantic Yards and develop the 21-acre site into offices, retail, housing, and a sports arena, is creating some controversy based on its scale and dependence on eminent domain. But by upping the percentage of affordable rental units to 50 percent, FCRC has managed to defuse a great deal of community opposition. The Williamsburg Savings Bank building isn’t in Williamsburg; rather, it has anchored downtown Brooklyn’s Atlantic Terminal with a gold-domed clock tower for 78 years. In May, HSBC sold the building to a partnership including basketball star Earvin Magicc Johnson’s development company, Canyon-Johnson Urban Funds, which intends to restore and renovate the old commercial structure into a condo building with 33,000 square feet of ground-floor retail. 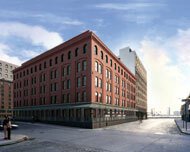 The rehabilitation of this 1910 manufacturing building is DUMBO’s most recent conversion of a factory-turned-artist’s studio into condominiums. The building’s relatively narrow floor plates made it more suitable for residential use than many of its bulkier neighbors, several of which will remain as studio space. The phones in New York architecture firms seem to be ringing constantly these days, and it is often developers on the other end of the line. But it isn’t always Durst, Vornado, Related, or another of the large and well-established companies that have long been at the top of the city’s real estate heap. According to Nancy Kleppell, an independent marketing and business development consultant who trained as an architect, one prominent firm she works for has been inundated with requests that they join in development projects. Over the last few months, the number of people calling us to work with them has risen to three or four a week,, said Kleppell, but the strange thing is, when we ask if they have done any development before, the majority respond that it is their first project..
Inexperience may have some advantages, though, at least for younger architecture firms who’ve never built projects from the ground-up before. Developers new to the game seem more willing to take a chance on architects unproven at larger scales, like nArchitects, ROY, and Sanders Becker. The triumph of the idea of loft livingg is so complete that brand new loft-style apartment buildingssunsullied by the ghosts of grommeters, die-stampers, and the likeeare springing up in places where no factories ever rose. In New York City, the birthplace of the converted loft, we’ve moved on from industrial buildings to old banks and insurance company headquarters. The real estate monthly The Real Deal reported that building owners are getting 30 percent more for buildings sold as residential instead of commercial, regardless of their origins. As housing prices climb skyward, any building with a narrow enough floor plate to allow light to penetrate to the center is fair game for condo-ization. 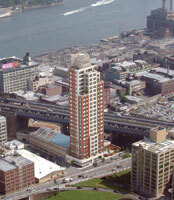 Conversions of well-known commercial buildings like the 1909 Metropolitan Life building on Madison Square Park East, the 1875 Williamsburg Savings Bank in downtown Brooklyn, and Cass Gilbert’s 1913 Woolworth Building opposite City Hall Park have grabbed the headlines, but they’re joined by humbler office towers across the city. While we’re not likely to see Bank Stylee or File Cabinet Luxee touted in marketing brochures, office living is here to stay. New York State’s most famous wielder of the eminent domain law was undoubtedly Robert Moses who, over the course of his five-decade career, reshaped our understanding of the public goodd?the clause governing the limits of proper eminent domain useeas much as he did the city. The intervening decades have not been kind to Moses’ legacy, however. Perhaps as a direct response to his method of wholesale bull-dozing, the taking of private lands for the public good is typically used as a last resort, and almost always creates a controversy. Though the June Kelo v. New London Supreme Court decision has brought the debate back into the headlines, it won’t actually change New York State law, which has long recognized economic development as an acceptable cause for eminent domain seizures. In the city, the most prominent project that may need governmental assistance in the form of eminent domain is the Atlantic Yards project, the 21-acre mixed-use development in Downtown Brooklyn developed by Forest City Ratner Company. 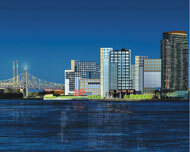 Mayor Michael R. Bloomberg and the City Council are on record as supporters of the project.